Aloysius O'Kelly (1853-1936) was an Irish painter. Aloysius was the youngest of four boys and one girl to the Kelly family of Dublin. His grandparents on his father's side were natives of County Roscommon and his father ran a blacksmith's shop and dray making business in Peterson's Lane. It was his mother who directed him towards a career in the arts. His uncle on his mother's side was John Lawlor, a successful sculptor, and his cousin, Michael Lawlor, was also a sculptor employed in London. Aloysius' brothers, Charles and Stephen, also became artists, whereas the eldest brother, James J. O'Kelly, set forth on a successful political career. O'Kelly traveled to Paris in order to enroll at the École des Beaux-Arts in 1874, where he studied under Bonnat and Gérôme. 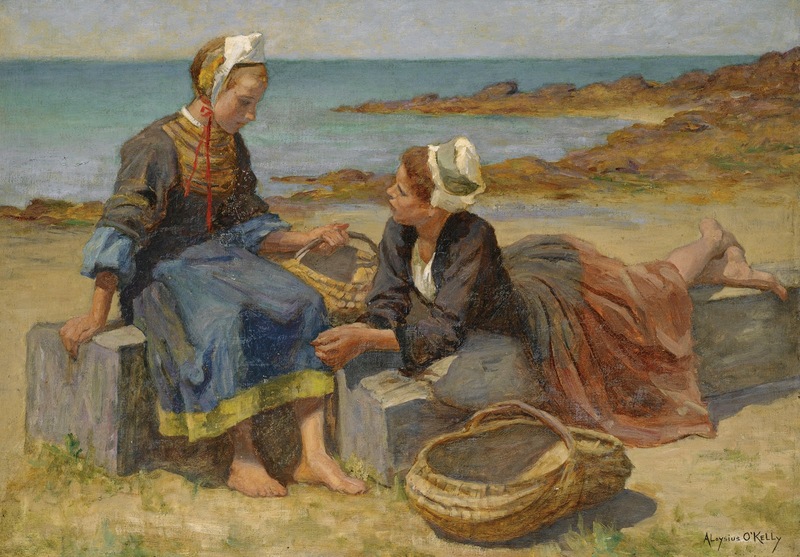 He traveled to Brittany in 1876 painting its aesthetic coastlines, fishing ports and villages. In October 1881, Charles Stewart Parnell, a member of Parliament and leader of the Irish Party, was arrested and imprisoned in Kilmainham. Two days following his arrest, Aloysius' brother, James J. O'Kelly, along with some other Party members, including John Dillon, were imprisoned where they remained until May 1882. A number of Aloysius' drawings during this period portrayed the political situation dealing with his brother's incarceration.